Everyone Piano is the software that is used to play the beautiful music, so some anti-virus software thinks it is to capture the keyboard information. Here we promise Everyone Piano is 100% safe, no virus, no trojan and no risk. We advise you to add it to the white list for normal use. Now with Everyone Piano, all will be changed! 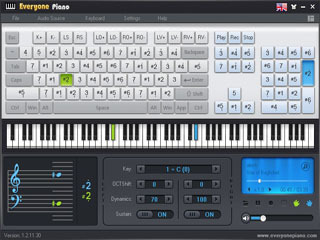 Everyone Piano can customize the keyboard, play the halftone, support record, playback, music score show, inflexion and octave. 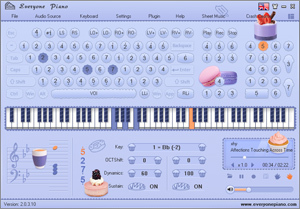 Besides all the features above, Everyone Piano also has the demo and teaching music. Everyone Piano saves everything for you, it is not only for free, but also supports a mass of music scores for studying. • Support keyboard apart, two hands playing. • Support automatic accompaniment, rhythm packing and synchronization. • Connect externally MIDI keyboard or electronic organ. • Customize the note layout of the keyboard. • Switch the dynamic skins. • Support stave and numbered musical notation learning. • Adjust the playing speed. • Support loading the Vsti sound database. • Support onboard sound card, timely playing. • Simulate the pedal of piano. 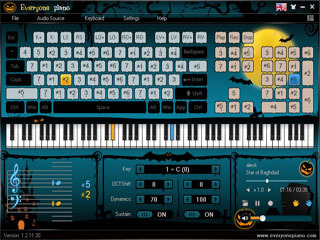 • Customize the keyboard and support playing semitone. • Support record, playback, music score show, inflexion and octave. • Come with the demo and teaching music. • Come with dozens of teaching and entertainment plug-in. •The purpose of Everyone Piano is that let everyone one can learn piano with "Zero Cost". 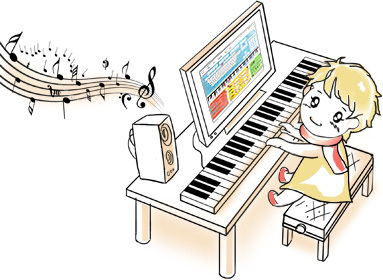 And you can also get more functions on how to improve your piano skills. •Support loading the VSTi sound database (eg: True Pianos, Pianissimo) . 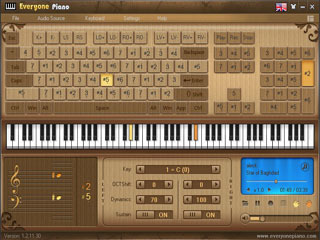 With powerful timbre database, Everyone Piano's tone is lifelike and real-time. You can enjoy the grand piano easily. •Support keyboard apart, two hands playing which is very useful for new learners. It can improve your learning speed and the cooperation ability of both hands. •Connect externally MIDI keyboard or electronic organ. •Have different versions: Adult Version, Children Version and elder Version. •Support many demo and teaching music. Make the learning process be interested. •Support by Everyone Piano website, make communication and sharing conveniently. hello .. EP is interested.. i already intall it but can not support for 64bit vst ... available for 64bit EP software? Hey, there. can this software convert mp3 file to eop file? Hi, Jus bought a Funkey RP61 M. It&apos;s wrote that it works with on mac os but I can&apos;t make it work and I don&apos;t have any CD in the box. Where can I find the driver please ? When my keboard will be ok, can I use it to work on Sibelius ? Best. EOP only can work on Windows system recently. There are EOP users use it on Sibelius. and what the Alternative for Mac? EOP is for windows system only recently. eop file can not output midi file recently. Is there windows 64-bit version? I can&apos;t load 64-bit VSTi plugin on Everyone Piano. Hi! Thank you very much for making this app! I&apos;m very happy knowing that there is a piano application so I can learn music, especially piano. I am from poor family so I can&apos;t have music instrument and learn more about music. dear team, you are doing fabulous work. but I have a question. I have a projector desktop, you can call it a theater room. the only problem I face with this software is to unable to enlarge it to full screen. I can see some 4k display having this issue as well. please suggest me what to do if there is a way, if not please take it as a request for further development. Double click the above part of the EOP Menu bar, EOP will enlarge to full screen, no matter 4k display of projector desktop, you need connect with windows PC, right? That, it can full screen in you pc, also in desktop. But too large size will distort. Could you please make the Linux version too? Thanks for your support of EOP, since EOP has lots for functions need to be developed, that we do not have enough energy and money to do all system at the same. We need do one by one. Firstly, EOP is a free software, everyone can download it freely in our site. Secondly, can you explain the trouble you met in detail? How can a software in pc to make your piano stops working? you are joking! Do you mean we can trough internet to control your piano? even you? we have more than illions of eop user, you are the only one that saying EOP can making a piano broken, just like after using EOP, you are ill. we do not think is our fault. No matter how, thanks for your support of EOP, once. I am sorry, I cannot get your meaning AGAIN! What do you mean PC keyboard sounds like a piano stops working? Do you mean your PC keyboard cannot play with EOP or somethings else? AND 2995 for what? EOP is a free software, pc keyboard is yours. CAN YOU EXPLAIN IN AN ESAY WAY? Okay you&apos;re starting to get it right I know EOP is a free software that makes your PC keyboard sound like a piano and it works but when I open it up with the plugin EOP NMN follow me it stops working I paid $29.95 to have full access to the practice software EOP NMN follow me I believe it&apos;s a driver problem now do you understand the EOP piano software stops working when I try to use it with GOP NMN follow me That&apos;s why I paid the $29.95 to have full access of the EOP NMN follow me software. I NEED TO GET HELP WITH THIS. Thanks for we are getting to know each other now. Feel much better. 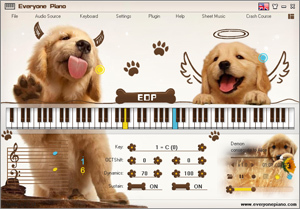 We have some thing to explain for you first, EOP is free software to play with pc keyboard or midi or pino. And EOP NMN Follow Me is a free plugin of EOP to open EOPN file downloaded in our site that can play and listen the sheet. And 29.95 is for EOP Demon Training Camp? Right? (You need first say you buy EOP tutorial) This tutorial is used in EOP NMN Follow Me plugin, and if it not works well in your pc you can connect with us with email to tell the detail about, we will try our best to solve it, and if you want to refund, you can apply for a refund directly. After all, thanks for your support of EOP. OK, no matter you cannot understand me or I cannot understand you, we just talk how to make your Demon Training Camp to use in another PC. Firstly, you need know you can choose to pay for one PC or TWO when you pay for it. IF you choose TWO, you can enter the Series Number for the second one to get a new Receipt Number. IF you just pay for one PC in other word buy one Receipt Number, you just can used in One PC. I think this is easy to understand. BUT, no matter what the problem is, we can help you solve it, you can tell us your payed email to support@everyonepiano.org, we can clear the receipt number to make you have a new one. Hi, I think it would not be too hard when an editor composed a song that included both the easy version and the perfect version (they could compose the perfect version first, then remove the unnecessary notes to form easy version). We are talking about learning. So surely have an easier version for the song (focus on voice and accompaniment) for begining, besides a perfect version for pro. I hope in the future you will be able to produce more songs (catch up the trend, are currently hit songs) and more versions to learn (because some songs are too hard). Thank you for what you did. how can i get muzak from my files?? Can you explain the trouble you met in detail? What do you can to get? eop file or mp3? or something else? How do I convert eop to midi format? You can open midi file with eop, but cannot convert eop to midi directly. Hi, can you tell me what program you using to see sheet music? I have some midi file (of course from other sources) and i want to share for my friends. I see your sheets are great, clean and easy to read. I wish you had composed these songs to share the sheet for everyone. But maybe the music of my country will not be your goal, at least this time. So I want to know what software you are using to print sheet music. Do you mean how to make mid files to sheet format? You can try overture, it can input mid to sheet, and our sheet is be done or shared by EOP users with sheet format directly, we make other format with our software or manually. I see, thanks :) I will try Overture. Bonjour je viens de télécharger votre logiciel et j&apos;aimerais apprendre une musique comment je dois m&apos;y prendre ? You can download sheet and play it with pc or midi keyboard. Double click on the eop file, it will be opened by EOP program automatically.If not, you can click File menu on the top left corner and click Open option to choose the eop file you want to open. Or you can drag the eop file to display window on the bottom right corner, it also can be eopen by EOP. What is the system of your PC, and what dose it show to you when you open eop file? You mean all eop files you download need change the expansion or just one you download? If all, I think it is due to some settings of your PC. If only one or some of them, it maybe caused by some specific symbol in the name, and you can tell us which one, we will change the name for them.